Everyone deserves a best friend, and I'm lucky to have several. Seriously lucky. But my BFF of all time who is in the BFF Hall of Fame History is undoubtedly Kalle. (Pronounced Kay-Lee) Since age 13, we've been joined at the hip, the soccer cleats, the ugly braces, the awkward hair stages, what have you. She's been my go to for a laugh, a foodie tour, a prayer, or just hanging out being myself. So when this beauty turned 30, my wish was her command. 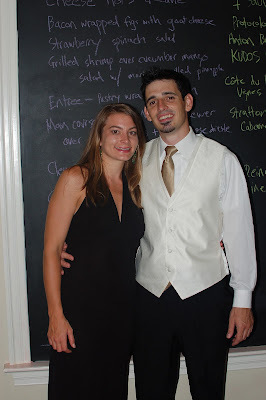 Lucky for me, this momma of two and lover of all things edible wanted an uber-fancy dinner party for her 30th. Being that I love a) menu planning b) party planning and c) Kalle, I happily obliged. With the amazing help of our friends and Kalle's sweet husband Shawn, we pulled off an extraordinary evening filled with restaurant worthy food, copious amounts of wine and no shortage of laughter. It was a night to remember! First off, here's K's beautiful family. 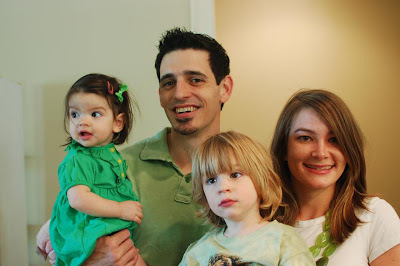 She is a great, fun momma, her husband is a doll and her kids are adorable and hilarious. Can you tell I love their family like my own? But sometimes you just need to get out of your mom clothes (joking Kalle, you don't have mom clothes) and get all fancy for a gourmet meal. You just do. One of Kal's favorite colors is coral, so I thought the theme of coral and silver would go together nicely. For invitations, I decided to go the handmade route, which honestly I had never done. There are so many amazing stationary folks out there (hello, I'm talking to you Party Box Design), but for this occasion I wanted to put a really personal touch on the invites. I headed to my local Paper Source (within walking distance from mi casa - danger danger) to pick out supplies. 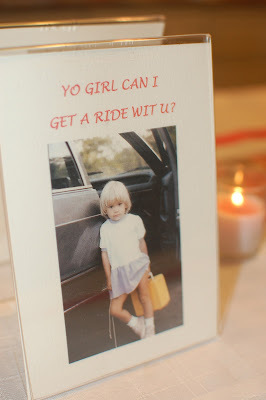 After talking the saleswomans ear off, I decided on simple invites with a sparkly embossed "K" stamp as the motif. I used the "K" throughout the party decor. I must say, making the invites was REALLY fun, although I only had to make 6. Perhaps after 20 I'd be crying. Also, if you're wondering, this is my handwriting. Those of you that know me and have seen my chicken scratch know what a feat this is that the writing is actually legible. I consider the party a success based solely on this fact. I got flowers for the table from the Farmers Market, which always has an abundance of dahlias at a super reasonable price. The coral flower candle is from Pottery Barn and I've had them awhile (Thanks Drew!). I've been waiting for the perfect excuse to use them and this was definitely it! 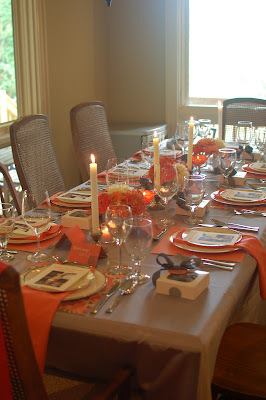 I used my go to rental company Party Reflections for the linens, a gorgeous silver tablecloth and coral napkins. One of my favorite party tricks is using scrapbook paper. In this case I used floral and coral paper from Michaels for place mats. I also used them as tags on the Cake Ball party favors that I had made by a great local party gal. How pretty did these turn out?! 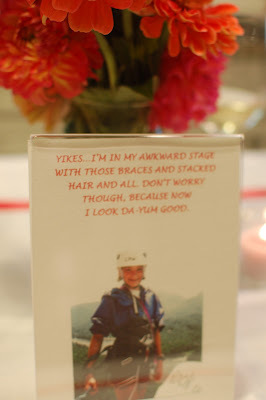 I used fantastically awesome photos from Kal's childhood to decorate the party and the place settings. Her hair was so awesome. The food was put up on the massive chalkboard in the kitchen. Let's dive right into it. Warning: Prepare to Drool! As all good parties start, there was an amazing cheese plate. Which I served with bread in this seriously cute and perfect serving caddy I found on clearance at Tarjay. Perfect colors! The next course was the Bacon Wrapped Figs. Aka bacon wrapped piece of heaven. 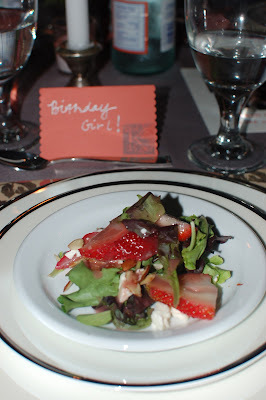 Followed by a light and refreshing Strawberry Spinach Salad. Next up is Shrimp on top of Grilled Pineapple with Mango Salsa. So yummy. My contribution was the Phyllo Wrapped Spinach Stuffed Chicken. It was time consuming to make but turned out really well (if I do say so myself!). How about the next course - Beef with Blue Cheese Sauce and Grilled Asparagus, plus Israeli Couscous with Walnuts, Dried Cranberries and Brown Sugar. Holy crap it was good. 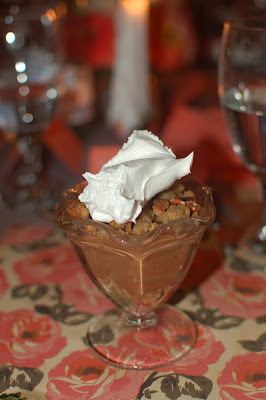 For dessert there was a perfectly delicious French Silk Parfait which was just as good as it looks. Oh...and don't forget the wine which was expertly paired with each course. Man this was such a fun night and I wish it would happen again and again. It makes turning 30 seem not so bad... How could it be when you're surrounded by great friends, in a beautiful home, with fine wine and food! 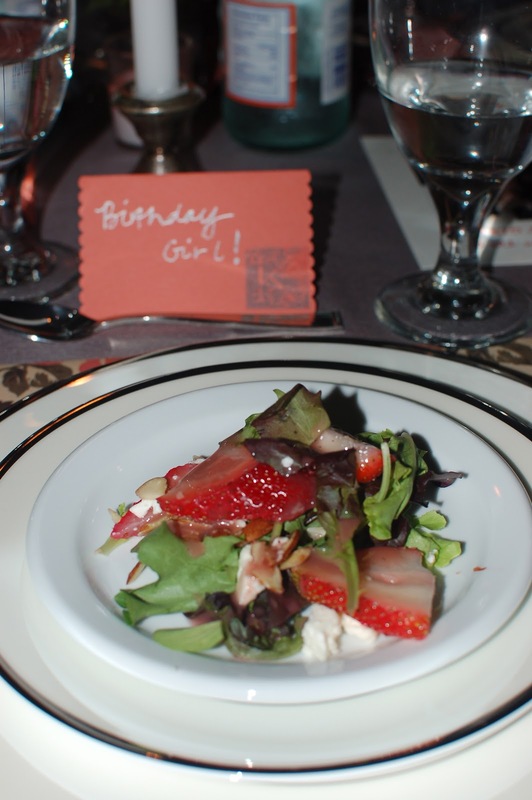 Props to everyone for going the extra mile and preparing delicious dishes to celebrate our friend. Happy Birthday to my best friend - I love you mucho! Totally drooling! Over the menu & the gorgeous table! Such a fantastic way to ring in 30! was hands down the best birthday ever, thrown by the best friend ever. i'd like to repeat if everyone isn't still full... love you! Jackie... A JOB WELL DONE! STUNNING TABLE DESIGN and my mouth is watering over that meal! This was all so beautiful and well thought-out! So great for such a special lady :) Thanks for being such a good BFF to her. All the details are so beautiful! Love the color palette...and that food looks amazing! Another great party under your belt!